Spring (bridal) showers mean summer wedding flowers are on the way! It also means that it’s time to make those final suit selections for the men in your party. 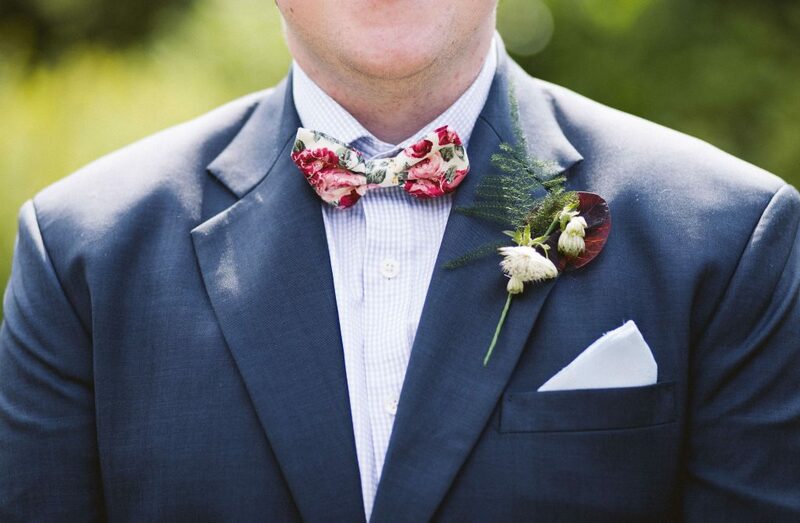 This summer, grooms, attendants, and guests are opting for formal wear with a bit of color. We all love a classic black tuxedo, but summer is the perfect time to experiment with something more bold for your event. Grey suits are having a huge moment this season. From heather and sterling to plaid, there’s sure to be a shade or pattern to catch your eye. We love this classic look because it’s neutral and readily accepts the light and bright colors of a summer wedding palette. Our picks: Pair grey with pastel pink, rich lavender, avocado green, fiery magenta, or robin-egg blue. Another popular summer wedding suit color is blue! Again, there are several shades to pick from including dark navy tones to brighter cobalt, slate, and indigo. Some of these suits are trimmed with black for a sharp two-tone look. When it comes to pairing colors with these suits, go neutral. Our picks: Pair blue with white, cream, eggshell, silver, or black. Finally, consider a tan suit. This pale hue is perfect for beach-theme nuptials and coordinates with weddings featuring bold palates. 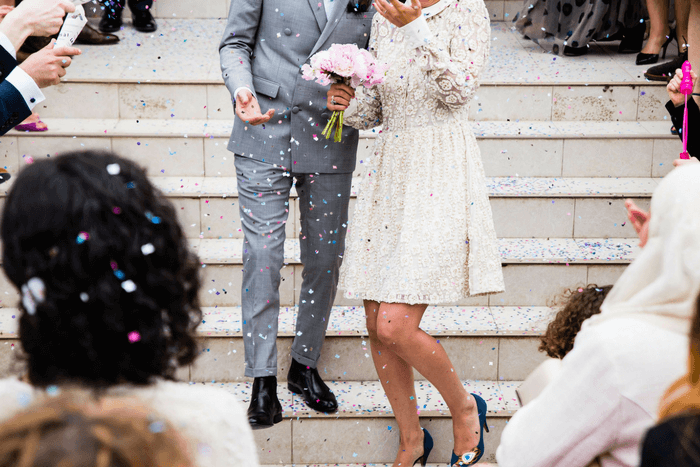 Does the bride dream of a rainbow bouquet and colorful boutonnieres to match? Are the men set on paisley-printed ties? Choose tan suits! This soft, neutral color easily pairs with everything. Our picks: Pair tan suits with bubblegum pink, juicy tangerine, baby blue, and snow white. Whether you stick with a classic black wedding suit or try one of the colors mentioned earlier, you can always add a refreshing summer vibe to your ensemble with the accessories you choose. Shirt: You don’t have to wear white to a wedding! Take a cue from the runways and opt for a colorful dress shirt under that suit jacket. Or, experiment with a novelty T-shirt when dressing for a less formal wedding. Pocket square: Solid or patterned, you can’t go wrong by adding summer-inspired colors to your look with a swatch of style in your pocket. Match this with the bridal party bouquets or the attendants’ dresses. Tie: This accessory usually coordinates with the pocket square, but doesn’t have to! Try a bold color-blocking style by choosing a solid-color tie in a color differing from your solid-color pocket square. Color combos we love include yellow and blue, pink and green, and purple and yellow. Cufflinks: Channel summer vibes with silvery palm trees, gold dolphins, or colorful seashell-shaped cufflinks. For a bonus, attach matching charms to the ladies’ bouquets. Socks: Each time the men sit, let a hint of personality peek out with some fancy socks. 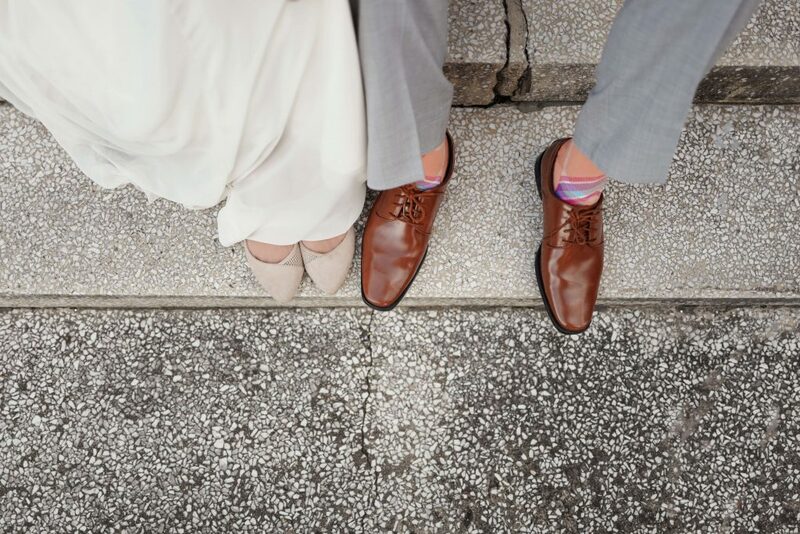 We love the idea of having all the men in the bridal party match with uncommon-patterned socks. Shoes: Don’t stop with socks! Opt for summer shoes at your casual wedding. White sneakers or beach-ready sandals add a laid-back vibe to your warm-weather wedding. Are you ready to finalize your summer wedding look? Browse the Jim’s Formal Wear online wedding catalog to see more wedding suit colors and styles to consider for your big day!